Every time you spend big on AdWords, SEO and social campaigns – it’s all pointless. Because people are clicking, but your website is scaring them off. First impressions count. In fact, research shows us that web design drives a whopping 94% of first impressions. Bad design leads to lower trust and higher friction. This means, no matter how much traffic you drive to your site, if your design isn’t right, your leads will walk straight out the door. Make your website earn its keep, put it to the litmus test of these common design mistakes. 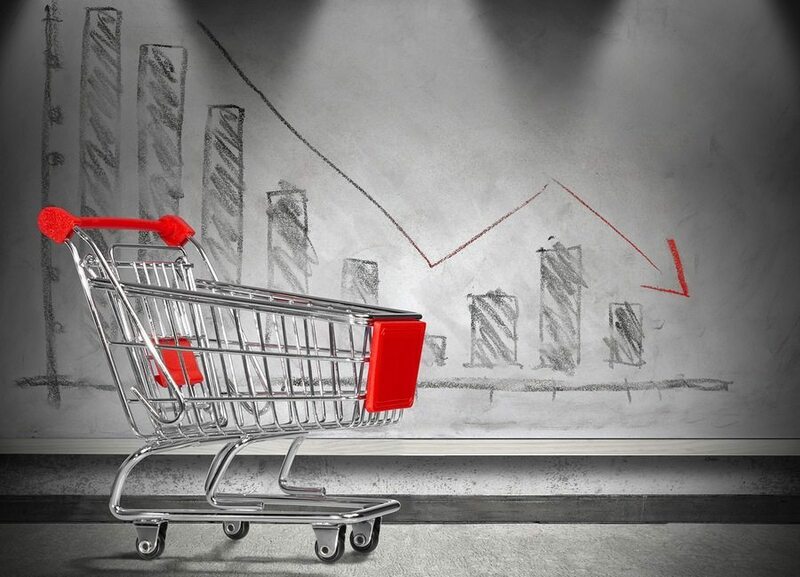 Here are 12 common mistakes that mean people won’t buy from your website – you don’t have to be making them. I’ve seen thousands of websites in my online marketing career and most have something in common. They don’t sell. Rather they are simply online catalogues. 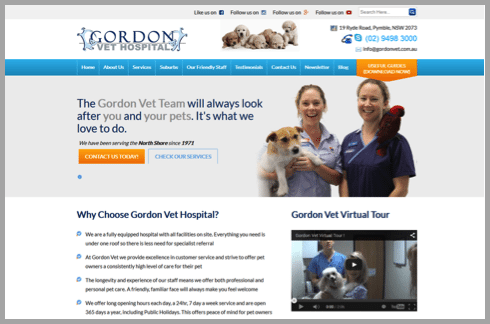 Take a look at this example of the Gordon Vet Hospital. The ‘before’ home page represents fairly typical mistakes. It’s a list of the services on offer—an online catalogue. Notice the difference in the ‘after’ web design? It uses real staff photos instead of dated stock images. 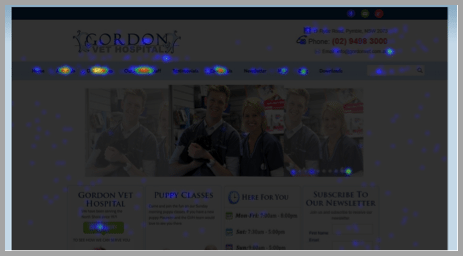 There’s a call to action above the fold and solid reasons to choose Gordon Vet Hospital. And there’s a visual tour of the hospital facilities and staff, which encourages great impressions of a well-functioning medical centre. Do you sell to consultants, academics or truck drivers? Does it speak to your demographic? Has it been translated into the same vernacular they use? Is it comfortably within their education level? Will the design, images and content appeal to them? It’s unlikely that a truck driver will willingly read the Financial Review, or an MBA-graduate read a trucking magazine, so don’t try to make them. Users spend roughly 5.59 seconds focusing on a site’s written content. These statistics come from eye-tracking studies conducted at the Missouri University of Science and Technology. This means you don’t have much time to capture a readers’ attention, so make sure that you write great stuff. Have you ever scrolled to the bottom of a web page to where a copyright date is listed, and found that it’s outdated by a year, or two? It doesn’t offer much confidence that the company who owns the site is doing any recent business. A website that’s outdated, or looks that way because of an outdated design is an instant turn off to clients. Ensure that your website is current by implementing the latest technology, refreshing existing copy regularly, and adding new, quality copy every week. The ideal length of a blog post is claimed to be 7 minutes or 1,600 words according to research from Medium. However, this assumes it contains interesting, informative material. Long stories or page content with rambling copy about how great you are without any proof or examples to back up your claims, tends to have the shelf-life appeal of a month-old cooked prawn left in the sun. You’d be surprised at how many users check out your ‘About Us’ page. I used heatmaps to track users’ behaviours on our websites across 10 different industries and found that ‘About Us’ is one of the most visited pages on the website. The ‘Contact Us’ page ranks almost on the same scale. Even if you run business from home, your website should have a phone number and email address for users to see and call or email. Having a simple web form without any basic contact information looks transient and suspicious. Users do actually want to know more about you so showcase what you’ve got. If you have great staff, tell them. If you have high profile clientele, let them know. This is a poor example of an ‘About Us’ page. It does not provide any ‘personable’ information. It doesn’t say who they are. It doesn’t say how they operate. If there was a heatmap indicating trust levels, and wouldn’t that be handy, this page would be colorless. Have you ever personally bought something from your website? How many steps were involved? If it was more than one, then it was too many. In other words, your checkout should be a one pager. Requiring guests to sign up before they can check out, or even view the home page, is another turn-off. You need to facilitate a checkout option for guests. 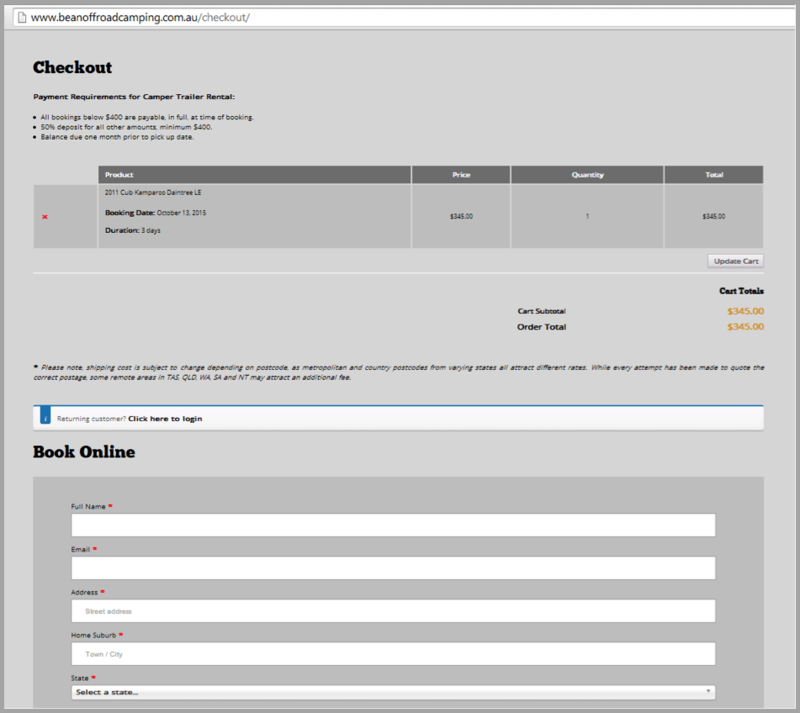 See below an example of a better way to do this – one page checkout process. It’s a website that Result Driven SEO built for Bean Offroad Camping. 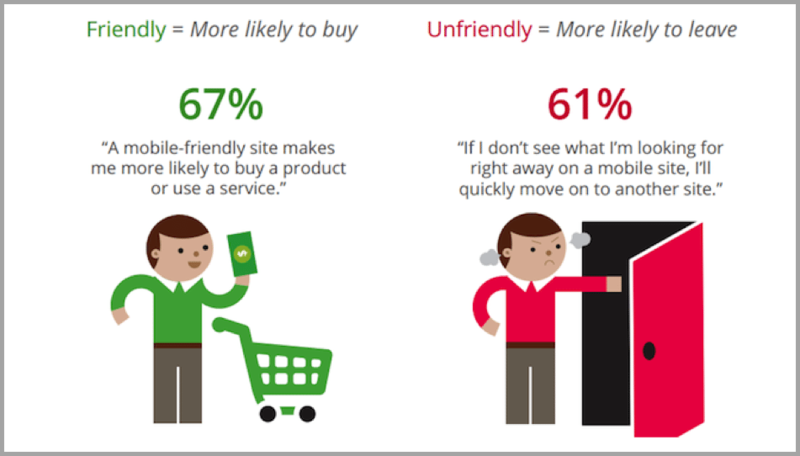 When users first land on your website, they don’t know you, they don’t trust you, they might not even like you, so how can you expect them to buy products from you? Missing contact information, bad reviews, and a lack of social proof can damage a user’s confidence in your brand. Prior to doing business with your company most clients will cast their eyes over online reviews from third-party sites such as Trip Advisors, Google Plus Local or other local directories. These independent reviews carry a lot of weight on the ‘trust’ scales. It’s important to generate them, and to ensure they are positive. Set up Google Alerts to monitor what other people are saying about your business and address their comments immediately to manage your online reputation. According to research on Trust and Mistrust of Online Health Sites participants mistrusted websites because of these elements. Take a look at this example. How do you feel about doing business with Web Marketing Experts now? On the flip side, noting company partners, media mentions, staff photographs, certifications and links to active social media accounts generates strong credibility for Delacon. Bad SEO techniques can hurt your website and make it a complete waste of time. Google will crack down on your website if it detects questionable practices such as links that are irrelevant to the website’s theme, keyword stuffing, cloaking, linking to irrelevant websites. It will tighten the penalties and be harder on those who appear on guest blogs. For information on how to recover from such Google penalties see here. Mobile search is the future and 72% of Consumers Want Mobile-Friendly Sites, Google Research indicated. So what, exactly, are consumers looking for in a website accessed from a mobile device? o examine if an individual page is mobile-friendly, go here or to check the status of your entire site, go here . If your site’s pages aren’t mobile-friendly, Google warns there ‘may be’ (read ‘will be’) a significant decrease in mobile traffic from Google Search. But once your site becomes mobile-friendly, it will automatically re-process (i.e., crawl and index) your pages. You can expedite this process here. If a picture is worth a thousand words, a video is said to be worth a thousand pictures, or a million words. Either way, video is powerful and provides a quick and easy way to impart a lot of information effectively and in a digestible format. If I’m seeking a sales report extension for a Magento website, I am more likely to consider a provider offering a video that demonstrates how the extension works. See this blue ribbon example of an aheadWorks landing page for their Sales Report Extension. It offers video, demonstrations and plenty of reviews. Your Google ranking for your website will be prioritised if it hosts a video, because Google now owns YouTube, so consider getting a 90-second corporate video to improve your SEO. There’s a new breed of specialists emerging who do this quickly and cheaply. See a great example here of construction company AMG Constructions by YouTubeHelp.com.au. explains why the customer should buy from you and not from the competition (unique differentiation). Your value proposition should be the first thing visitors see on your home page, and on all major entry points of your website. It relies only on the video to do the job. Your value proposition should also be in words that people can read. Video supplements words, not replaces them. 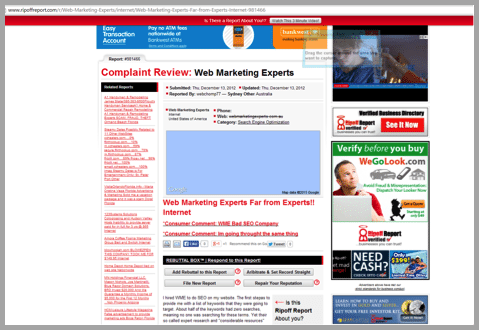 Awful clarity: “We’ll supercharge your website”? Nobody will understand what that means. Example of Go Rapid’s cheesy stock image representing a movie-star good looking financial advisor who talks to a ‘bad credit car finance’ audience. Example of Harley Finance using images that relate to their target audience—owner-drivers who might not have good financial resources. You don’t want your website visitors to leave your website without doing anything. You need to at least capture their basic information so you can follow up. You can do this by providing a free consultation or offering a great deal. Who doesn’t like free stuff, after all? You need to highlight the call to action you prefer users to take. Two best practice examples of how to do this. The call to action itself uses simple language that can be successful for many types of business. The word “get” is often highly motivating. The fact that Square doesn’t charge for its product is likely to be genuinely surprising to many prospects, which reinforces the value of the offer and makes it more tempting. Between the minimal form (just three fields), the strong indicator of potential benefit (“Start accepting credit cards today”) and the great offer (the free Square card reader), this landing page/call to action combo is a winner. Using a Lenovo PC or Laptop?